One of the unique things about military culture is teamwork. It begins on the first day of training and never ends throughout an entire career. HSFA leverages veterans’ spirit of teamwork from point of entry, to graduation and on the job. HSFA hires VET volunteers into a team of 8 participants and provides each team member with a unique number (e.g., A-1-1), which includes their team assignment and case number for the duration of the program. The first 2 numbers represent their team (e.g., A-1). The final number represents their position on the team, and is assigned randomly. Team member #1 is the team leader. Teams are encouraged to connect offline and motivate each other to complete their volunteer work together and on time. HSFA is proud to be an Official Certifying Organization for the President’s Volunteer Service Award (PVSA). History. PVSA was started by the President’s Council on Service and Civic Participation in 2003 as a way to thank and honor Americans who, by example, inspired others to engage in volunteer service. Tracking. HSFA VET Team members work and record their hours in the PVSA tracking system. HSFA verifies all hours recorded. Award. When all 8 VET Team members complete the required minimum 25 hours of volunteer service within 30 days, the entire team receives the ultimate honor of presidential recognition. 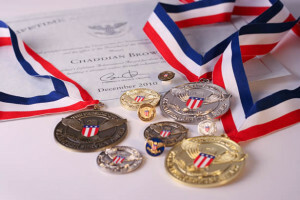 Recipients will receive a personalized certificate, an official pin, medallion or coin and a congratulatory letter from the President of the United States. Challenge. Teams are encouraged to continue volunteering throughout the 30-day evaluation period and even during the 30-day certification period. At the end of that 60 day period, teams, who cumulatively complete 200 hours of volunteer service (25 hours each) will be awarded the bronze medal. Teams, who complete 500 hours of volunteer service (62.5 hours each) will be awarded a silver medal. Teams, who complete 1,000 hours of volunteer service (125 hours each) will be awarded the gold medal. Recognition. All team members and their families are invited to a brief graduation ceremony, and awards are given at that time.